Dolo Odo (Agenzia Fides) - As a result of the dramatic drought, the phenomenon of the displaced people of the southeast villages of Ethiopia, bordering Somalia, continues. 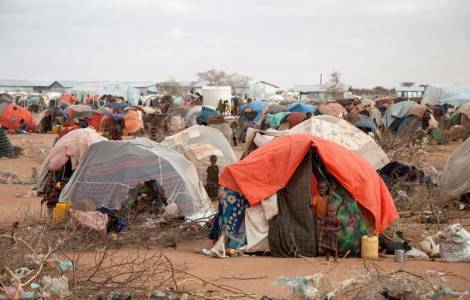 In the so-called Somali region of the Country, where the population is ethnically Somali, but of Ethiopian nationality, there are 264 villages with 577,711 displaced persons. The figure comes from the International Organization for Migration (IOM) census carried out between May and June of this year. "For those who have lost any source of livelihood, the only solution is to go to one of the 'hotels' made available by the government to satisfy hunger and thirst. However, government means are not enough and it is absolutely necessary for humanitarian aid organizations to intervene", says to Fides a local source who prefers to remain anonymous. However, displaced people are only one of the challenges that the region faces every day. In fact, it is expected that from July to December, two and a half million people will need groceries and, according to humanitarian agencies, the figure may have already exceeded 3 million and 300 thousand in mid-August. "Due to the lack of funds, in June and July we managed to only reach one million of the one million and 700 thousand people in need in the Somali region", said World Food Program spokesman for East Africa. In this region of Ethiopia there is a large part of the 1,056,738 registered by the IOM in the Country. The phenomenon of displaced people in the area is associated with internal conflict and disorder. Camps in the northern part of Siti, which expanded during the famine in 2015 and 2016, continue to be full.